I feel somewhat guilty for giving this 3 stars. It has all the ingredients to be a 4 or 5 star read,...A beautiful coverAn admirable main characterGood supporting charactersNew, creative ideashowever there was something lost in the delivery for me, hence my 3 star rating. Information felt like it was being dumped on me at occasions (fruit bat boy? huh) and not entirely explained, and as a reader I like to have specifics in my mind as Im reading, as apposed to specifics explained at a later time.But never fear, It does improve later on in the book and thus made for a more enjoyable read in the second half... but not to the point where I want to sing it's praises. However saying that, I'm glad I did stick this one out, as once the world building at the beginning of the novel eased up, the second half allowed the story to take place and the writing proved to be excellent, and I was rewarded with a strong ending.Seraphina is actually an admirable character, but I found she did not inspire greatness, despite her passion for music and magical(?) abilties. Likewise her relationship with Kiggs, whilst nice, was not particularly exciting. Their constant chats in regards to Saints, left me feeling a little lost and a lot of their chemistry was placed on their conversations in reference to them. Kiggs whilst nice, wasnt quite charasmatic enough of a love interest for me personally.What I did love about Seraphina though was her development throughout the novel. 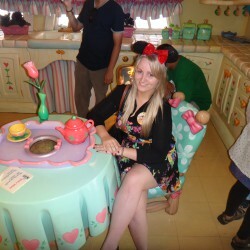 I loved her self-conciousness. Her battle with scales on her skin. Having to lie to the humans in which she was close to. I also loved her relationship with a certain dragon character, Ormar, I heart him dearly, playing a family role like no other. And I loved and laughed at the bits where dragons were in a position of emotional distress and the ensueing confusion they faced at having to deal with human emotions. Absolutely delightful. 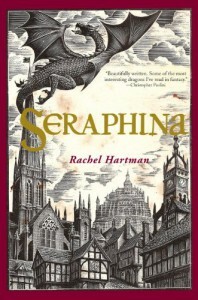 I think Fantasy lovers, will love Seraphina, and it's not one to be missed if your a fan of the genre.